You are here: Home / Main / The Force is Back! 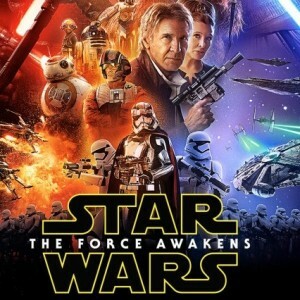 Unless you’ve been frozen in a block of carbonite for the past year, you know that Star Wars: The Force Awakens, the seventh film in the Star Wars franchise, opened last weekend to the largest box office in film history, pulling in nearly $250 million in North America alone, and over half a billion dollars worldwide. Stormtroopers trooped into selected theaters on opening night for pre-screening festivities and fans dressed in costume to celebrate the return of the “real” Star Wars. (Many fans refuse to acknowledge the disappointing prequels.) Actors, director, and film pundits were interviewed on television and in print for weeks leading up to the release. Hour-long specials chronicled the history of the franchise and the making of this film. Jimmy Fallon watched, aghast, as guest Harrison Ford tore apart a collectible 1977 Han Solo doll (er, action figure) on the Tonight Show. It has been a spectacle worthy of the Roman Colosseum — or Boba Fett’s next dinner party. So let’s start by addressing the first question reviewers are asked whenever an overhyped movie comes to town: is it any good? Fox Business host Neil Cavuto spent an entire show last week proclaiming the film to be “stupid” and “nonsense.” To be fair, I think Cavuto was just being contrarian and having a good time in a spontaneous interchange with Bobby Jindal. Nevertheless, my advice to Cavuto is, stick with your day job and leave the night job to film lovers. Star Wars: The Force Awakens is spectacular. Star Wars was a once upon a time, a Saturday matinee cliffhanger, an old-fashioned romance, and a cowboy western all rolled into one, dressed up in spacesuits and alien life forms. Cavuto — and fans — had reason to be skeptical about this latest offering. The original trilogy was a masterpiece of mythic storytelling combined with groundbreaking special effects that changed the direction of action films. Who can forget the first sight of that gigantic spaceship scrolling across the screen, looming ever larger and bringing with it an ever-increasing sense of wonder and foreboding? Before we could even think, “How did they do that?” we were drawn into the story that took place “a long time ago in a galaxy far, far away.” It was a once upon a time, a Saturday matinee cliffhanger, an old-fashioned romance, and a cowboy western all rolled into one, dressed up in spacesuits and alien life forms. When the ending credits for Return of the Jedi rolled six years later, we were satisfied, but immediately hungry for more. We wanted to know: how did Chewbacca and Han meet? Why were Luke and Leia separated at birth? What happened to change the shining Jedi, Anakin Skywalker, into the Dark Knight, Darth Vader? Fans wrote their own stories, made their own movies, and longed for the official prequel. What was missing? In my opinion it was Marcia Lucas, who was no longer married to George and thus was no longer guiding the story from behind the scenes. Marcia edited the original Star Wars films and won an Oscar for it in 1977. By contrast, George has yet to earn a competitive Oscar. Lucas deserves all the credit for his creative vision and his skybreaking technology of Star Wars, and is responsible for the way every action film is made today. Kudos to him for all he has accomplished. But he needed someone who would nurture the characters. He found that someone in director J.J. Abrams. Nurtured himself by Steven Spielberg, Abrams knows how to make an action film exciting. He also knows how to create an homage that can stand on its own. Super 8 (2011), in which a group of young teens saves the world while making a home movie, is probably the best example. It is made in the style of Abrams’ mentor, Steven Spielberg, and contains a plethora of “Easter egg” references to Spielberg’s trademark moments, yet it stands entirely on its own as an exciting, well-made film. (See my review.) Similarly, in The Force Awakens Abrams provides audiences with ample nods to the original trilogy, including some sets and scenes that are nearly identical. Yet the homage never becomes distracting or overbearing. We simply enjoy the sense of nostalgia as we are carried along by the story. My grandson was so enthralled that he forgot to eat his popcorn until the movie was over! The story is a simple, classic quest: the rebel forces must find Luke Skywalker before the Empire, now called the First Order, can reach him. Within this overarching plotline we also find a story that focuses on friendship and family, and a theme that resonates with loyalty, redemption, and the freedom to choose one’s path. The characters care about each other, and because of that, we care about them too. There’s nothing stupid or nonsensical about that, Mr. Cavuto. Is The Force Awakens a sequel or a remake? It takes place 30 or so years after Return of the Jedi, and Han, Luke, and Leia are senior members of the ongoing resistance. Sequel, right? Yet in many ways the story is a remake of the original: as stormtroopers attack, a droid is entrusted with an urgent message. A trio of rebels — one woman, two men — travels through the galaxy in the ”piece of junk” Millennium Falcon on a quest to save the world. Once again we are treated to wide vistas of strange, majestic landscapes through which our heroes trudge with tireless resolve on their way to new adventures. We see sets and scenes that seem familiar, and some that are identical to those that appear in previous films. Abrams even casts rebel pilots who look almost exactly like the pilots in the original film 40 years ago. Some reviewers have called this repetition “derivative,” but I consider it thematically essential. The message is subtle but clear: history repeats itself. We must be constantly on guard and ready to fight against the tyrannical forces that would enslave or destroy us. Each victory is but a respite before the next onslaught against our freedom. Characters in film are often defined by the costumes they wear, and the costuming is outstanding. As before, officers in the First Order wear caps and epaulets reminiscent of the Third Reich, reminding us of the tyranny of empire-building. Their textures are heavy, dark, and oppressive. By contrast, members of the resistance wear natural fabrics and leathers. Rey (Daisy Ridley) wears a tunic with soft, feminine ruching held in place (and out of the way) by rustic leather straps. Her costume reminds us that she is a woman, but she is girded to fight. She carries the weight of the resistance in her careworn eyes and doesn’t have time to worry about holding her own against “male privilege.” I suspect her name (which means “king” in Spanish) will be revealed as significant in a future episode. Ridley is simply perfect in the role. Finn (John Boyega) is another character defined by his costume; when he puts on the leather jacket of the rebel Poe (Oscar Isaac), he also puts on Poe’s mission. Unfortunately, Boyega doesn’t put on Poe’s personality. I was disappointed by his bland acting — no charisma. I also wanted Carrie Fisher to open her mouth a little bit more when she spoke, but I had the same problem with her in the original Star Wars In fact, I had to watch it a third time before I could decipher all the dialogue. But these are niggling complaints. 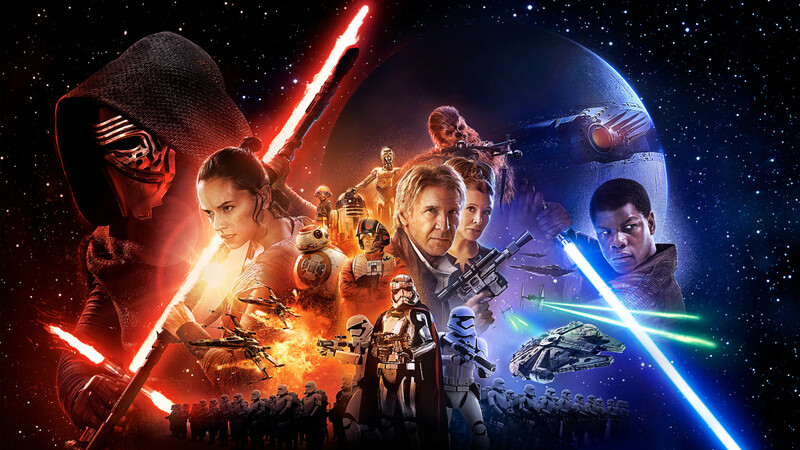 Star Wars: The Force Awakens is a triumphant return of the Jedi. I can’t want for the next installment. Editor’s Note: Review of “Star Wars: The Force Awakens,” directed by J.J. Abrams. Disney, 2015. 135 minutes.